An amateur archaeologist from Hamilton is shining light on a little-known branch of Ontario's history. An amateur archaeologist from Hamilton is shining light on a little-known branch of Ontario’s history. 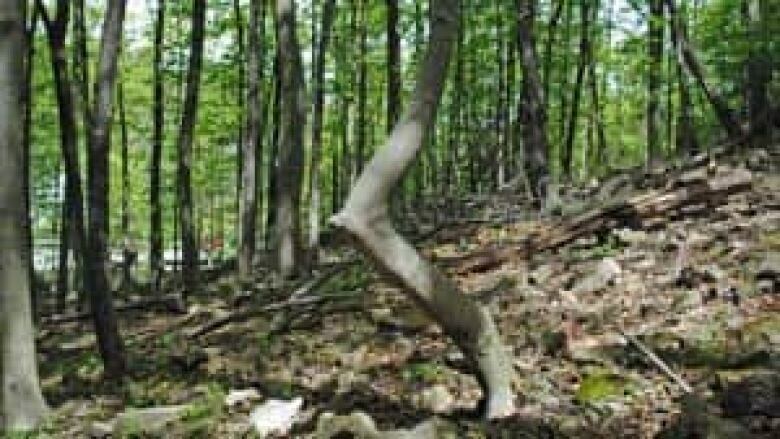 Bob Doidge has photographed and documented dozens of trees he says were purposely twisted and reshaped to mark important First Nations sites. 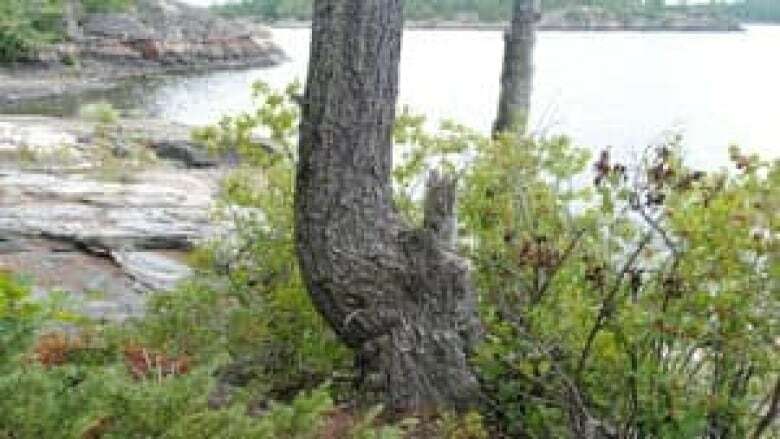 He first noticed a series of nearly identical altered trees, all standing at prime camping spots on a northern Ontario river, where Doidge spends his summers. "It's inspiring to me how obvious they are because I've followed them to some degree in northern ontario to find things that are very, very important," Doidge said. The full-time musician and producer says his part-time hobby has led him to identify three specific types of modifications. Camp markers: trees with a fork in the top, what Doidge calls the 'split pine'. Doidge doesn’t want to reveal the name of the major waterway in northern Ontario where he photographed the trees, because he’s worried the artifacts they point to may be destroyed by an influx of curious visitors. 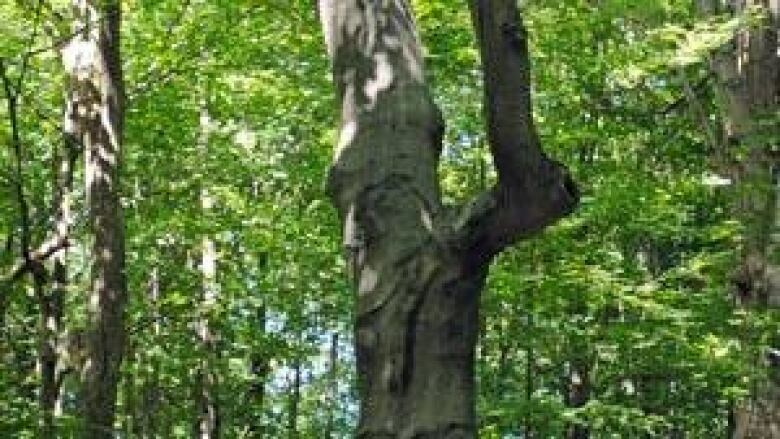 But recently he started noticing similarly altered trees in southern Ontario, especially along the Bruce Trail. "They look like road signs, once you start seeing them — and they're everywhere," Doidge said. "Like everyone else, I’ve been passing these trees all my life and never noticing that 'hey, this tree is so different from anything else in the forest.' 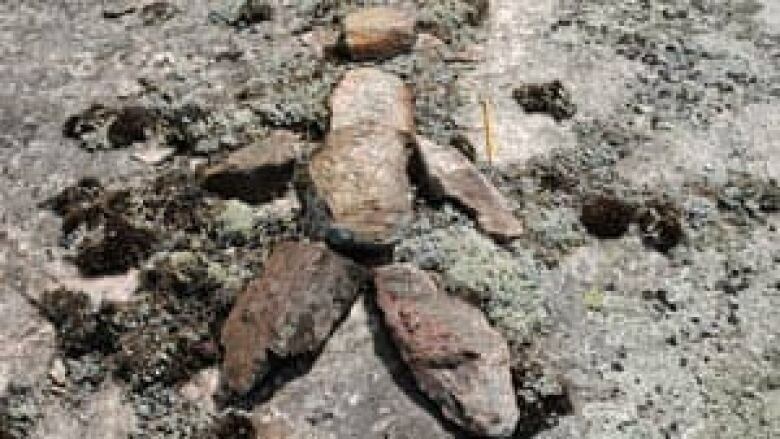 And once you recognize a few of them, on the Bruce Trail you could not go a full kilometre without seeing one." Doidge said he believes First Nations people used vines to twist branches together and cuts and grafts to change the tree’s growth as a sapling, so it would grow into the proper shape. He's hoping to continue documenting the trees and talking to people about their meaning. It’s an area of research that hasn’t been a focus for most archaeologists in the province, according to Scott Hamilton, who works in Lakehead University’s department of anthropology. Hamilton said research more often looks at the economic uses of trees, such as bark stripping for basket or canoe making. But Hamilton said he is aware that trees were marked for other reasons. "I do remember elders telling me that the way graves used to be marked is with blazes on trees," Hamilton said. "It’s a means of symbolically recording that something important happened here." However, the long history of logging in the province may have erased much of the evidence of culturally modified trees, he said. "We don’t have trees that have survived and persisted for a long period of time," Hamilton said. "There was a very significant logging industry. Certainly most of the older more mature trees would have been cleared out by the 1910s, 1920s." Doidge’s research is catching the attention of the Ontario Archaeology Society. He recently presented to their Hamilton chapter, and has been invited to do same for the Toronto group. "I’m hoping the people who are on the Bruce trail will start to make sense of these things," Doidge said. "And if nothing else, if I was canoeing in northern Ontario and looking for a place to camp, I’d just paddle until I saw a split pine and then I’d know its a place where I’d have everything I need."